I was thinking about one of my very best birthdays. I was in 7th grade and it was the year of the balloons. 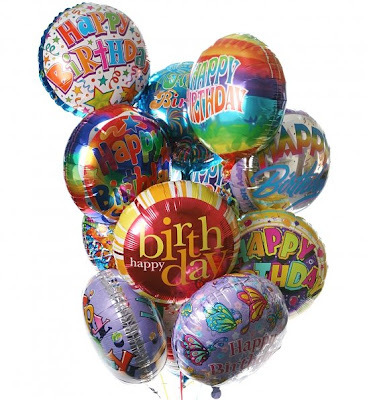 In middle school all of your friends would bring one Mylar helium balloon to school so that all day long you could parade the fact that it was your birthday. Being a great fan of my own birthday, I had made sure everyone knew my birthday was coming up. Also working to my advantage was the fact that I was friends with a lot of people from a lot of different social circles. When I showed up to school that morning the balloons kept coming and I ended up with a huge balloon bouquet- one of the biggest I had ever seen at Scott Highlands Middle School- and proudly walked them through the halls with me from class to class. It was a big deal. I remember feeling loved and remembered and popular. I loved those balloons. But a funny thing happened just three days later. That day it happened to be one of my dearest friends birthday. She was one of the most loyal friends I have ever had. Her birthday came and there were only three of us who brought her balloons. And all day long she had to bring those three sorry balloons with her to all of her classes. I felt her embarrassment, and the whole day was uncomfortable. That year the veil was lifted in a pretty profound way for me as I watched my bedroom full of mylar balloons begin to droop. Somehow those balloons had become something so much more than balloons and I didn’t like it. It knew it wasn’t right. Isn’t it amazing how we seem to be able to pick such arbitrary objects to fixate our affections? God must go crazy sometimes trying to keep up with our ridiculous fads. Limes for Amy, balloons for Becca…and in the end it is all so silly. And sad. Makes me wonder what my current day “balloons” are…and makes me want to pop those idols real fast. Great insight Bec! I love reading about what you are pondering! I find myself challenged as well, so thanks!